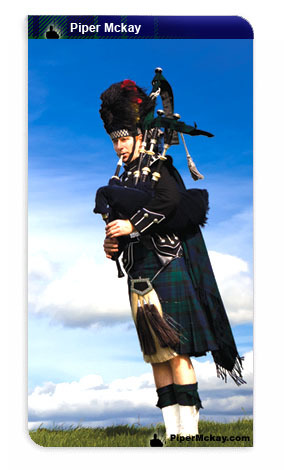 Scotland has a wealth and variety of music and one of the oldest and most successful of wind instruments is the bagpipes. In its origins never the property of one people or nation, it is now strongly identified with Scotland, especially in the form of the Highland Bagpipe. This powerful instrument has a long pedigree deriving from prehistoric shawms and hornpipes of Near Eastern civilisations, evolving with bag and drones in Classical and early European history, and emerging as a familiar instrument by the 12th century. The pipes were being played in Scotland by the 14th century and in the Highlands by about 1400. They achieved their recognisable form in the late 16th and 17th centuries, with decorated chanter and drones, when they also overtook the harp as the musical instrument of Gaelic society and assumed a traditional role in Gaelic culture. They complemented the bardic tradition of brosnachadh - encourgagement and incitement - the praise of warriors and chieftains and the lament for their passing. They were played in the Great Hall and naturally for dancing and entertainment. Dynasties of pipers emerged, such as the Mckays, MacKays, MacLeods, MacCrimmons, MacGregors, and Cummings, who performed the duties of official piper for their patrons through successive generations and who sustained and generated the music of the bagpipe until the collapse of the society which nurtured them in the wake of the Jacobite wars of the 18th century. The Highland bagpipe survived by virtue of the growth of the empire and standing armies and these influences standardised the instrument and styles of playing. Piping both in Scotland and in Europe as a whole had been characterised by a variety of music and playing styles, and of the instrument itself. In 1297 the Mckays fought at Stirling bridge with William Wallace. In 1314 the Mckays fought at Bannockburn with Robert the Bruce. Piper Mckay's forefathers, namely Piper Kenneth Mckay of the old 79th (Cameron Highlanders) was commended by King George the III for his bravery at the Battle of Waterloo for his sangfroid under fire when he boldly marched in a deliberate fashion around the outside of the 79ths square playing his Pipes. The King was so inspired that he awarded Piper Mckay a specially made set of silver Pipes. Later serving Queen Victoria, Angus MacKay was the first personal piper to the Sovereign. He served Queen Victoria until 1854. Mackay is considered the Genius in Piping classical piobaireachd music and is held in the highest esteem to this day.